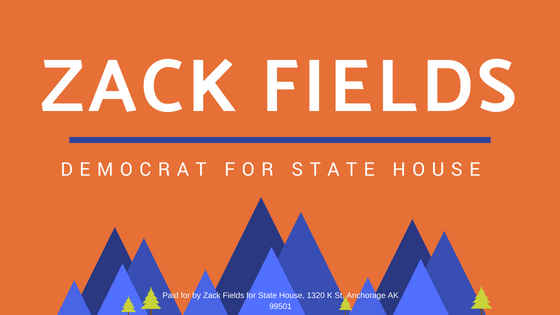 Anchorage: The Alaska Center has endorsed Zack Fields for House District 20 in both the Democratic primary and the general election. The Alaska Center is an influential grassroots non-profit that supports salmon fisheries, clean low cost energy to address climate change, and Alaskans' voice in the public process. "I am honored to have the support of The Alaska Center, and will continue working with the organization's members and leadership to achieve our shared goals," said Zack Fields. "Multiple Alaska communities are at risk of being destroyed by coastal erosion, while ocean acidification and rising sea temperatures--in addition to the proposed Pebble mine--threaten Alaska's fishing industry. With the Trump administration amplifying these threats, the role of the state legislature is increasingly important to protect Alaska's resources and economy," Fields added. "Zack Fields has been an incredible volunteer advocate with The Alaska Center for years, and we know he will stand up for our shared values in the state legislature. We look forward to working with him to advance policy that will create a just and sustainable future," said said Alaska Center Executive Director Polly Carr.